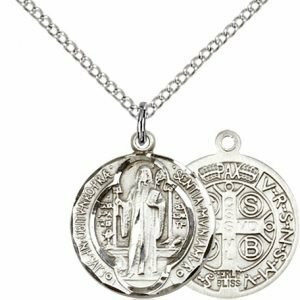 St. Benedict was born into a Roman noble family with his twin sister Scholastica. He grew up with the expectation that he would follow his family’s wishes for a career in Roman government. However, he was not impressed by the dissolute lives of others in his generation and at about the age of 20 retreated into a cave near Enfide. There for three years he lived as a hermit. As he matured in wisdom, age, and grace, others noted his qualities and invited him to lead their local community of monks. At first this did not do well, as the monks resisted Benedict’s efforts to bring greater spiritual discipline to their lives. Benedict is said to have escaped their attempts to poison him by miraculous means, once with a cup of poisoned wine shattering as he blessed it. Benedict went on to establish a number of monasteries, the most important of which was the Benedictine monastery at Monte Cassino where he died in 543. Monasticism had a long lineage in Christian life going back to its founding in Egypt in the 300’s. The life was one of heroic virtue, with some monks practicing long fasts and other ascetic practices to the admiration of their followers. St. Benedict was of a more practical mind. He wanted to create a model of monastic life that would make it possible for ordinary men to follow every day. He also wanted to create a community with the abbot as the father guiding the monks in the daily practice of work and prayer. The idea that physical labor can be dedicated to God and be a means by which men and women may work out their salvation is a revolutionary concept in Western civilization. In Roman society, work was what slaves did, while the aristocracy commanded them and used their leisure time to speculate on the meaning of life. What we understand today of the dignity of work as a necessary part of a mature Christian life was created by the life promoted by St Benedict. St. Benedict summed up his ideals in the Rule of St Benedict which became one of the foundation documents of Western Christianity. The Rule has only 73 short chapters. 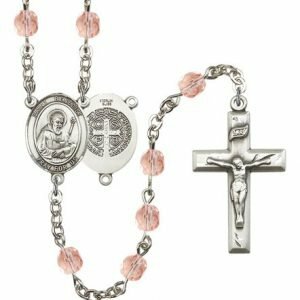 It deals with the question of how an individual monk may live each day with his mind on Christ as he works and prays. The Rule also covers the duties of the abbot running the monastery as a father, leading the community to live in harmony with God and one another. This would be the basis on which centuries of monastic life would flourish and give to Western Christianity a model of stability on which Western culture could grow. 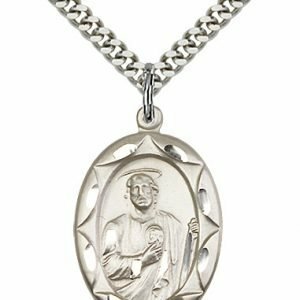 St Benedict is the patron of European civilization. His feast day is July 11. One of the more widely known saints, St. Benedict left behind a legacy in the Church that impacts our world even today, some 1500 years later. 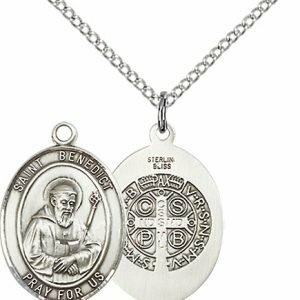 The “Rule of St. Benedict,” often used as the basis of constructing religious orders, is the main achievement of St. Benedict still used by religious men and women. 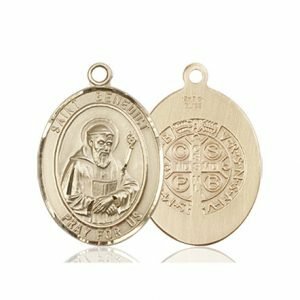 St. Benedict is considered by many to be the “father of western monasticism.” Perhaps the most popularized symbol of St. Benedict is that of the medal worn by many Catholics, which contains images of his life that convey a message of trust in God’s power and in His ability to overcome evil. 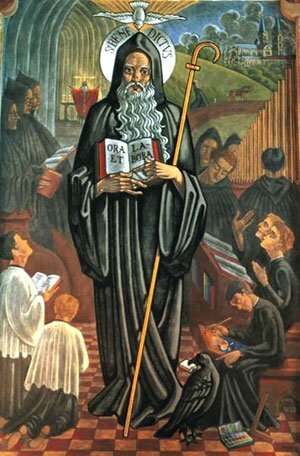 St. Benedict of Nursia was born in the year 480 in Nursia (now known as Norcia), in Umbria, Italy. Along with him was born a twin sister, who would come to be known as St. Scholastica. As a young man, St. Benedict was deeply affected by the loose morals of those in his community – for he could see the damage that their actions was having on their own souls and on the souls of others. He left his schooling to retreat away from the city of Rome, where he could spend time in prayer, contemplating what it was that God was asking of him. St. Benedict and the breadFor a short time St. Benedict lived among a group of virtuous, like-minded men in Enfide. Then he discovered a monk named Romanus living in the mountains of Subiaco, near Enfide. Romanus explained to St. Benedict his reason for retreating from the world to live in a mountain cave. 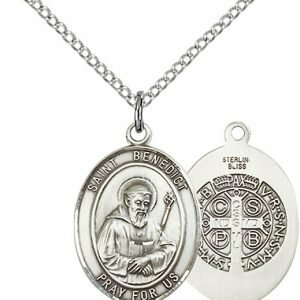 Attracted to a life of prayer, meditation, and simplicity, St. Benedict was given the monk’s habit by Romanus, and lived nearby as a hermit for three years, unbeknownst to anyone but Romanus, who provided him with food. During these years, St. Benedict grew in holiness and maturity, coming to understand himself and others more deeply. When the abbot of a nearby monastery died, the community came to St. Benedict and begged him to be their new abbot, for they had heard that he was a wise and good man. St. Benedict had heard of this monastery, and he knew that the way they conducted their lives was different than how St. Benedict felt the monastic life should be lived. He knew that it would be unlikely that they would agree; however, because they kept asking him, he agreed to become their new abbot. This proved to be a mistake, though, and the monks tried to poison St. Benedict. Their first attempt was to poison his drink. When St. Benedict said a prayer over his drink, though, it shattered. Next the monks tried to poison his bread. After blessing the bread, a raven flew in the window, picked up the bread, and flew off with it. 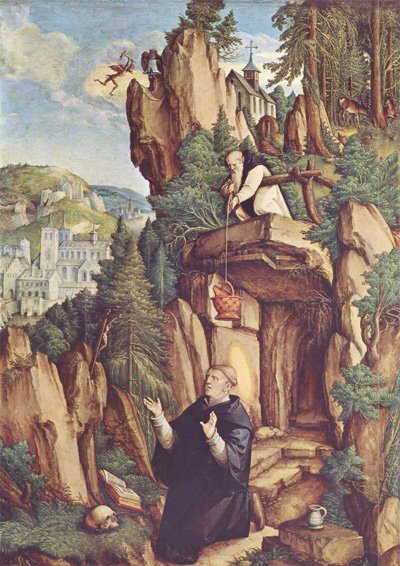 At this time, St. Benedict left the monastery to return to his cave in Subiaco. While living in his cave in Subiaco, his reputation for sanctity became known throughout the region, and many people began to visit, seeking his guidance. Many miracles are said to have taken place during this time. St. Benedict founded twelve monasteries around the Subiaco area. 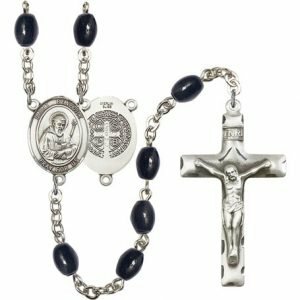 The most famous monastery founded by St. Benedict is the great Benedictine monastery of Monte Cassino, which is located on a hilltop between Rome and Naples. The “Rule of St. Benedict” was written to help keep the monasteries he had founded running according to the spirit and dedication with which they were established. In the “Rule,” there are 73 short chapters with two different types of focus: spiritual and administrative. The spiritual chapters teach the monks how to conduct themselves, as well as how to correct others whose behavior has become errant. The administrative chapters state how the monastery should be run, detailing the responsibilities of the abbot. 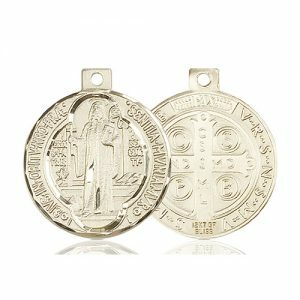 Two of the more common phrases excerpted from the Rule of St. Benedict are: “Ora et Labora” (pray and work) and “Let all guests who arrive be received as Christ.” These examples show the life of prayer and grace that St. Benedict wished to instill in his own monasteries, as well as the monasteries that would use his Rule in the future. St. Benedict was not the only one of the twins to enter into a life of monasticism. His twin sister, St. Scholastica, gave herself to God too, and founded a monastery about five miles from St. Benedict’s monastery in Monte Cassino. They would meet one time per year to visit with each other, for just a day. One time, while visiting, they spent the day praising God, conversing about spiritual matters, and delving deep into the mysteries of the faith. When it was time for St. Benedict to return to his monastery, St. Scholastica begged him to stay with her, for she was enjoying the conversation and the company so much. St. Benedict, always faithful to his rule, told her it would not be possible. At this, St. Scholastica bowed her head and wept. Outside, a thunderstorm began to rage, with lightning scattering across the sky and rain pouring so hard that St. Benedict could not possibly leave. When he asked her what she had done, she replied that he had not listened to her, so she asked God instead. Since he was unable to leave, he stayed there, up all night with her, talking about the joys of heaven and the power of God. 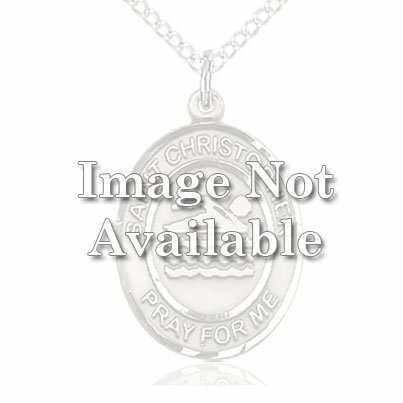 God had heard her prayers and allowed for the two saints to remain with one another just a bit longer, in prayer and spiritual discussion. Not long after the night of the thunderstorm, when God had allowed for them to enjoy the company of one another, St. Scholastica fell ill. It is said that St. Benedict looked to the sky and saw the soul of his sister ascending to heaven like a dove. He rejoiced knowing that she was entering into glory, and gave thanks to God. He asked that his sister’s body was brought to the place where he was to be buried, so that their bodies would remain together, just as their souls had always been. 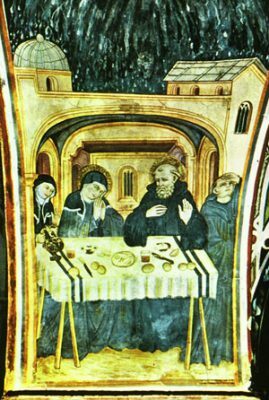 Shortly after St. Scholastica’s death, St. Benedict came down with a high fever and died. He was buried alongside his sister, as he had requested. St. Benedict was canonized in 1220 in Rome by Pope Honorius III. Originally his feast day was March 21, which is said to be the day he died. However, since this date falls within the Lenten season, his feast day was moved to July 11. His sister, St. Scholastica, is celebrated on February 10. St. Benedict is the patron saint of a wide variety of people and needs, including: against poison, agricultural workers, civil engineers, the dying, those afflicted with fever, those with gall stones, those with inflammatory diseases, those with kidney disease, members of religious orders, monks, schoolchildren, and spelunkers (cave explorers). St. Benedict is often depicted in art as an older man (usually with white/gray hair), wearing a black monastic robe. Sometimes seen with him are a cup, bread, and a raven, which tell the story of the poisoning attempts made on him. Other images seen with him are a book (the Rule of St. Benedict), and a crosier or cross, showing his role as abbot of the monastery. 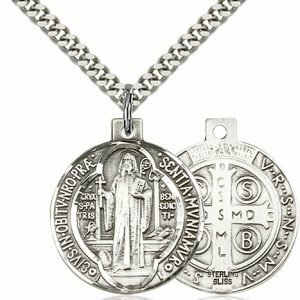 The St. Benedict medal is believed to be a very powerful medal, as it declares the wearer’s trust in God’s authority over evil and His ability to protect His children. 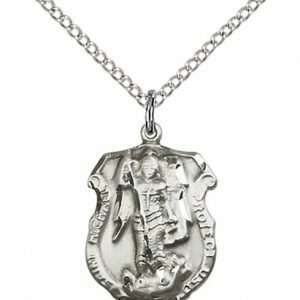 It is a striking medal different than most because of the number of images and Latin phrases or initials for Latin phrases. All told there are 36 words inscribed or represented by abbreviation on the medal. 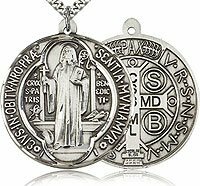 Learn more about the images and inscriptions on the St Benedict medal. 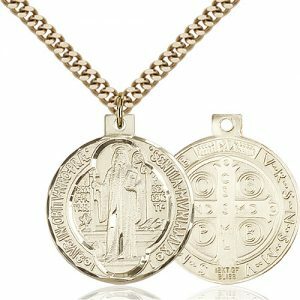 The medal was first struck in 1880 in commemoration of the 14th century since the birth of St. Benedict, though earlier versions were made throughout Europe. 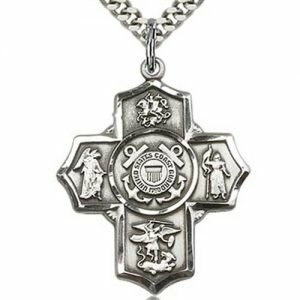 The first official approval of the medal was made by Pope Benedict XIV in 1741. 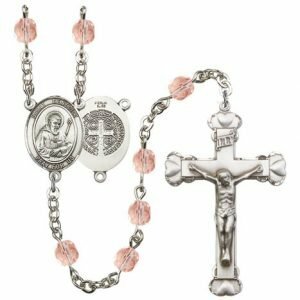 The medal is often worn as a necklace, but can also be carried in one’s pocket, attached to a rosary, placed in the home, or placed in the center of a cross/crucifix. 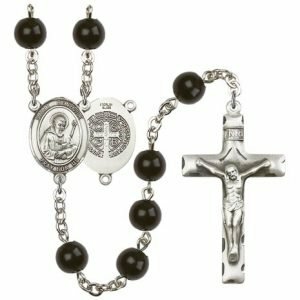 Let Saint Benedict be your partner in prayer as you say one of the prayers below or as part of your rosary devotion. 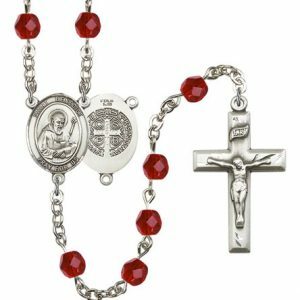 Find Saint Benedict Rosary Beads here. Practicing what you preached, you founded the monastic tradition of the West by joining prayer to labor for God—both liturgical and private prayer. Help all religious to follow their Rule and be true to their vocation. May they labor and pray for the world to the greater glory of God. Amen.